April 16, 2018 Robert W.
Stand up banner stand displays are being used at the events and shows in Las Vegas in great numbers. These inexpensive, quality display graphics are very popular with the vendors to display information about the good and services they are displaying to their customers. Stand up banner stand displays are the number one graphic being used at the events and shows in Las Vegas. With thousands of events and shows held yearly and millions of people coming to Las Vegas to partake in these shows, it adds up too many signs and banners. Thousands of events and shows take place in Las Vegas every year and display graphics are needed for these shows. The stand up banner stand displays come in many different height and widths to fit most vendors needs. From 2ft wide to about 5 feet wide and in different heights as well as premium stands that offer the wide chrome base. The banner stands start off at less than $100 and even the largest, premium stand is well below the $200 price range. All these stand up banners come with a convenient carrying nylon bag for easy transportation and many of these banner stands can be made the same day or next day. 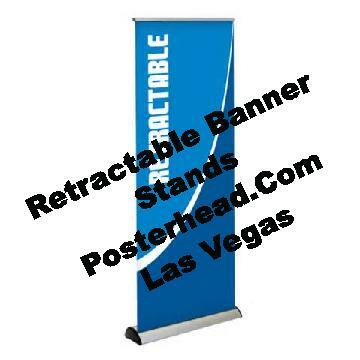 Several sign companies in Las Vegas offer same day banner stand service like Posterhead Signs ( www.Posterhead.com ). There are many more other types of signage that are available and popular at the events and trade shows. Vinyl banners, coroplast signs, foam board signs, vinyl lettering are just some of the other popular graphics that are used at shows to help vendors show off their products and services. Las Vegas has many sign companies willing and able to assist you in your display graphics at very reasonable prices. Contact some sign shops and compare prices and services and make your event or show a success !